OEM Product Solutions | Monitor Products, Inc.
Monitor Products specializes in a variety of traditional tube and shell heat exchanger products. Monitor Products evaluates, designs and manufactures products specifically designed to meet the customer established performance and cost objectives in conjunction with the targeted environmental exposure and duty cycle requirements. 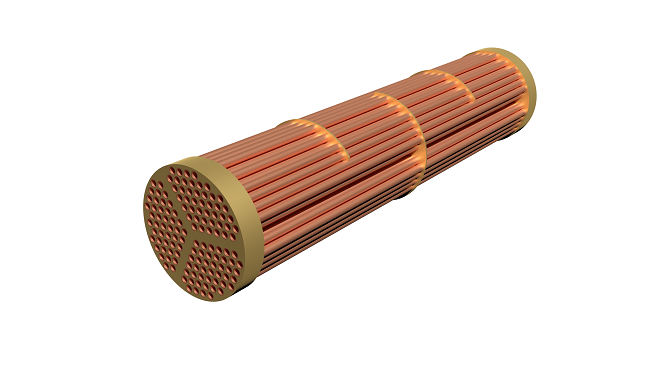 Traditional tube & shell heat exchanger designs utilizing a standard cylindrical copper shell are historically the most cost effective, design efficient and easily serviceable method for removing the heat out of an engine where an external water source is available. However, not all Tube & Shell products are built the same, perform the same or last the same. Monitor Products goes to great lengths to ensure that the Tube & Shell products we offer will not only meet but in many cases exceed Cost / Performance / Quality objectives established by our OEM customers. BETTER PERFORMANCE - Doesn’t Require Sealing Strips or Special Gaskets. BETTER PERFORMANCE – Allows 100% Coolant Flow Through the Engine at All Times. BETTER SERVICE-ABILITY - Unit Can Be Removed in Tightly Confined Areas. REDUCTION OF COMPONENTS – Eliminates Hoses While Integrating the Thermostat and Housing in a Clean & Compact Package. Cast multi-functional outer housing similar to common removable bundle coolers but with an internal narrowed section within the casting which includes an O-ring to separate the jacket water inlet and outlet. 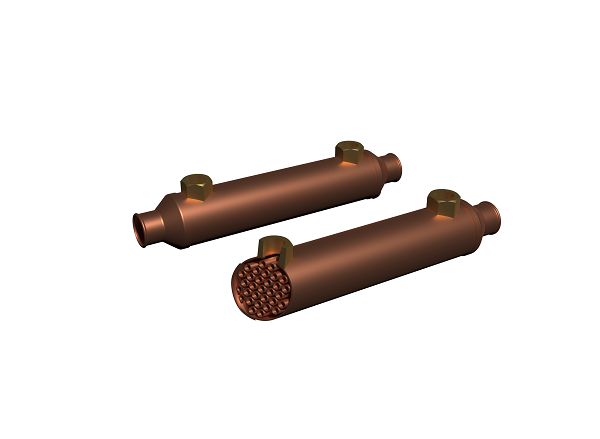 The heat exchanger unit utilizes a normal outer shell and is removable with two simple O-ring seals sealing against the outer shell at either end. This design totally separates the raw water and engine coolant seals making the cooler less vulnerable to common corrosion damage that occurs due to small raw water leaks around seals. Utilizes a large cross-sectional area O-ring to allow a more forgiving seal, unlike most removable bundles which typically require tight tolerances to seal properly. This makes for easier field servicing. Clean-out of the raw water passes is fast and easy. End covers can be removed with one or two bolts giving you complete access to both ends of the bundle without disturbing the jacket water seals. High performance knife edged dividers are sealed with brazing to maximize the number of tubes, and eliminate raw water leakage. This also eliminates the need for the thin and difficult to install sealing strips.